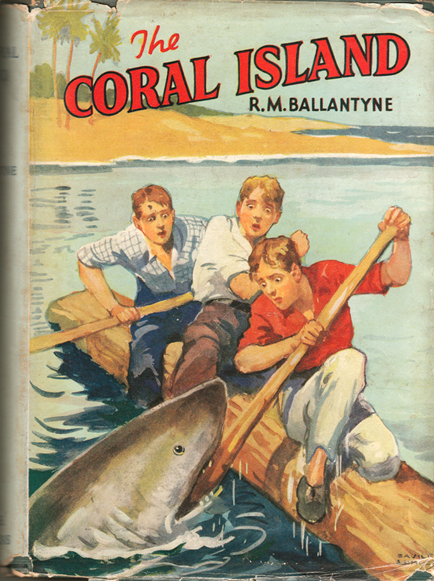 Description: From the Merlin series, this is one of Ballantyne's best adventure stories, The Coral Island tells of the tale of three boys, Jack, Peterkin, and Ralph, and their escapades when they find themselves shipwrecked on an uninhabited island in the Pacific. Illustrated with one excellent, colour frontispiece by the renowned British poster artist, Savile Lumley. Forest green boards with black, embossed text on front cover and spine. Minor discolouration along top edge; spine and corners bumped and rubbed. Dust jacket scuffed and torn along extremities (refer to image). Small horizontal loss at tail of spine. Another minor loss where on the lower-left edge of the rear cover. A few minor jots of foxing along page tips and on the pastedowns and half-title, otherwise all pages are in superb condition: crisp, clean, and completely free from tanning or foxing. No year of publication given, but believed to date from c.1930. Measures 20 cm × 14 cm (8″ × 5.6″). 8vo. 279 pp.